Printed from http://www.bodytalksystem.com//learn/news/article.cfm?id=897 on Apr 22, 2019. 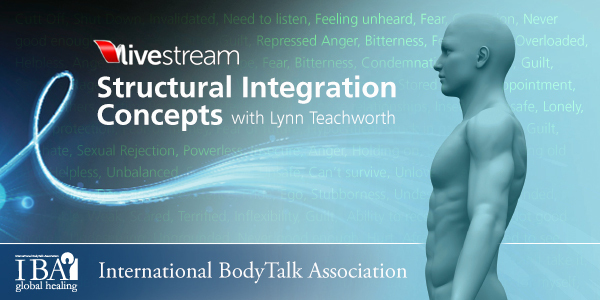 For those who have taken Lynn Teachworths Structural Integration for BodyTalk can monitor the course for US$157.50. You also receive access to the Structural Integration Forum should you have any questions. This class was LiveStreamed in March 2014 and due to the high demand the recordings are available to purchase in our store. "I just wanted to say that the Structural Integration course has transformed my practice. Being a massage therapist prior and having developed my own fascial structuring procedure I was getting great results before, but now with BodyTalk and the Structural Integration concepts applied I can see all the consciousness work I am doing and am now getting AMAZING results! I haven't had one client come in since the course that hasn't noticed a drastic shift in not only their structure but also their consciousness. Just getting peoples ankles aligned without any angles has brought them into the present and allowed them to not get so caught up in the thoughts about the past and future that stressed them out and caused the presentation in the first place! I am so excited to keep working with these concepts to see where else I can go with it.